This interesting surname is derived from the Old French personal name Herbert, itself coming from the Old German given name Hariberct a compound of "hari" or "heri" meaning "army" plus "berht" "bright" hence "army-bright". The Old French name was introduced into England by the Normans circa 1066, two namebearers being Herbertus and Hereberd appeared in the Domesday Book of 1086. The surname dated back to the early 13th Century, (see below). Further recordings include Richard Herbert (1221) "Assize Rolls of Worcestershire" and Reginald le Fitz Herbert (1347), "Calendar of Inquisitions, post mortem". 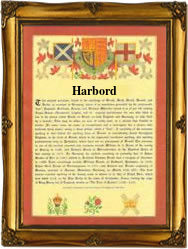 Variations in the idiom of the spelling include Herbit, Herbard, Harberd, Harbird, Harbot, Harbott, Harbud, Harbuttetc.. The poems of George Herbert, divine and poet (1593 - 1633) were read by Charles 1 in prison and commended by Coleridge. One William, son of Petter Harbard, was christened on February 1st 1617 at St. Bride, Fleet Street, London and William George Bartlett Harbord, son of henry and Sally was christened at St. Mary Magdalene, Bermondsey on January 3rd 1813. The first recorded spelling of the family name is shown to be that of William Herebert, which was dated 1206, "The Pipe Rolls of Dorset", during the reign of King John, "Lackland", 1199 - 1216. Surnames became necessary when governments introduced personal taxation. In England this was known as Poll Tax. Throughout the centuries, surnames in every country have continued to "develop" often leading to astonishing variants of the original spelling.